I don't hear that many bands from Italy but often the ones I do hear are quite cool. This is a 4 track EP and the band describes their music as heavy psych stoner trips, which for this release is a good description. 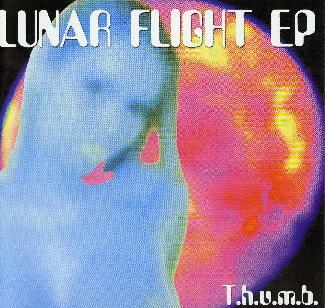 The CD starts off with the fantastic 9 minute title track, "Lunar Flight". After the space sounds, a heavy distorted wall of sound with spacey vocals and some cool guitar sounds here and there. It is quite psychedelic and spaced out while maintaining a hard driving rhythm and some great spaced out psychedelic guitar soloing. Awesome! "Wasted Words" is a very low-fi distorted track and quite psychedelic. "Kobal, the Eggman from Venus" is a short 1½ minute strange piece that leads into "Magic Drug", which is a fast track like a psychedelic Dozer track or something. Don't get too stoned when you listen to this CD... just a warning. Fans of early Monster Magnet will appreciate this! For more information you can visit the T.h.u.m.b. web site at: http://www.thumbrock.com. Visit the Wuck Records web site at: http://www.wuckrecords.com.